Contributing writers John and Sandra Nowlan take a trip to the Florida Keys and dive into the cuisine and adventure. We’ve always wanted to visit one of the funky restaurants featured on Food Network’s Diners, Drive-Ins and Dives. We finally found one in Key Largo, one of the fascinating communities along the Florida Keys, the long, thin string of semi-tropical islands stretching 110 miles from the Florida mainland to Key West. The Fish House, with its busy interior of hundreds of colorful lights, fish nets and mounted fish trophies sits at the side of US 1, the Overseas Highway, next to a dumpy souvenir stand selling four T-Shirts for $10. But there’s nothing dumpy about the food at The Fish House. For his popular “Triple D” show, Guy Fieri was treated to a creamy smoked fish dip made with local Amber Jack. Smoked with buttonwood, the fish appetizer was served in a lettuce leaf bowl with crispy crackers. Of course we had to try it, and it was superb! Our main course was Hogfish Matecumbe, baked with fresh tomatoes, shallots, fresh basil, capers, olive oil and lemon juice. It was one of the best fish dishes we’ve ever enjoyed. Our visit to The Upper and Middle Keys lasted only three days but we feasted on fish at several remarkable restaurants. At Marker 88 (88 miles north of Key West), we were seated at a table directly on a Gulf of Mexico beach to dine on cracked conch with wasabi aioli, crispy onion encrusted mahi mahi plus yellowtail snapper finished with key lime butter. Our most unusual restaurant was the Hungry Tarpon, adjacent to Robbie’s of Islamorada, where guests can hand feed huge tarpon, often a yard or more in length, that lurk around the pier. Tarpon are boney and unappetizing to eat but jump out of the water for food and can clamp their sandpaper-like teeth around a hand holding a small fish (YouTube has several videos but we missed filming the fish that grabbed John’s hand). The Hungry Tarpon restaurant has a few tables close to the pier and an open-air bar covered with dollar bills stapled into the woodwork and flapping down like small flags. We each ate a delicious ahi tuna taco, one grilled, one blackened. To wash it down we enjoyed an Islamorada Citrus Ale and finished with Bartender Tim’s signature drink, the Trailer Trash Bloody Mary. Made with cucumber vodka, blue cheese, a pickle, garlic olives, green beans, a crisp strip of bacon, celery, a beef stick straw and a jumbo shrimp, it was a totally unique cocktail! The Florida Keys offer much more than incredibly good seafood. Even though our time was limited (and we didn’t even get as far south as Key West) two unusual attractions were highlights for us. First was the African Queen, the actual boat used in the famous 1951 movie starring Humphrey Bogart and Katharine Hepburn. Constructed in England with riveted sheet iron, the tramp steamer (originally called Livingston) was used to haul cargo in the Congo for several decades before becoming a key fixture in the movie. Refurbished and moved to Key Largo in 1982, it now takes six passengers on a cruise down the Key Largo canal and out into the open Atlantic. Captain Robert is a wizened geezer (not unlike Humphrey Bogart’s Oscar-winning character) and makes for an entertaining 90-minute ride in an historic vessel. Our other fascinating stop in the Keys was at the world’s first sea turtle rehabilitation hospital in Marathon. When we visited, 48 injured and recovering turtles, ranging in age from two weeks to 60 years, were under the care of the staff. Some were cut by boat propellers, others caught in ocean debris. The goal is to return as many as possible to the sea but 12 of the reptiles are non-releasable because of serious problems. The 90-minute guided tour is an excellent introduction to these amazing animals. Accommodations are available on many of the major islands in the Keys (there are about 1700 islands in total) connected by 42 bridges. Because of limited building space, most of the hotels, motels and resorts have been around for several decades but prove to be of good value with a laid-back island style that’s very welcoming. We stayed at the 114-unit Islander Resort in Islamorada. The ’50s style resort has comfortable rooms fully equipped for housekeeping and includes a large, screened-in lanai with easy access to heated pools, a small sandy beach and a fishing pier. 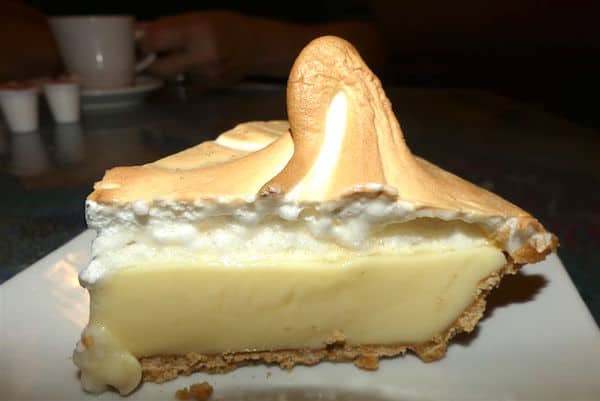 We couldn’t leave the Florida Keys without sampling its most famous dessert, Key Lime Pie. At every opportunity we ordered a piece of the sweet and tangy confection to share. All were homemade and varied in presentation, some with meringue and others with whipped cream (a few, sadly, of the artificial variety). The best ones had a tangy lime taste and smooth texture. The winners, in our judgment, were both from Key Largo – The Fish House and Mrs. Mac’s. It’s worth a trip to the Keys just for the pie. I loved when we drove the Florida Keys many years ago! Our favorite stop was John Pennekamp state park on Key Largo, which has the only coral reef in the continental US. The snorkeling (off a boat) was wonderful, and we had the state park campground pretty much to ourselves. I’m so chuffed to learn that the African Queen is still afloat — that almost beats key lime pie as a reason to go. I’ve shared this article on my Worldbite Facebook page! I am pinning this to for later. David and I are planning a Florida Keys trip in a few years and this will all come in handy. Thanks. While in the Florida Keys and Key Largo, I like the Catch Restaurant. It has good food and friendly service. It is near John Pennekamp Park.